OptiTrack is supported in Humanoid Control Pro. All OptiTrack hardware supported by Motive Tracker or Body 2.0. Make sure OptiTrack support is enabled. 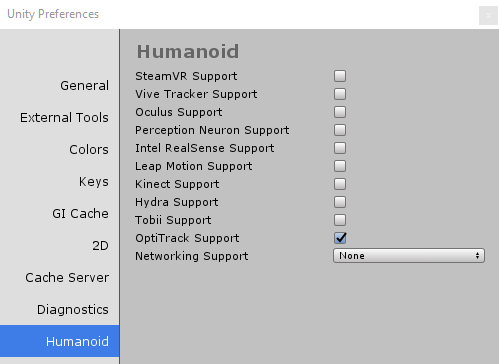 Go to Edit Menu->Preferences->Humanoid and make sure OptiTrack Support is enabled. Disabling OptiTrack support ensures that no code related to OptiTrack is included in the build. Motive:Tracker or Body is required for rigidbody respectively skeleton tracking. Ensure that Data Streaming is enabled. To enable OptiTrack tracking for an avatar, OptiTrack needs to be enabled in the Humanoid Control component. Enabling OptiTrack will automatically add an Humanoid OptitrackStreamingClient gameObject to the scene which will implement the communication with Motive. Make sure the Streaming Client parameter is pointing to this object. When Skeleton Tracking is selected as the Tracking Type you will need Motive:Body to stream the captured skeleton information to Humanoid Control. The Skeleton name parameter determines which OptiTrack skeleton is moving this Humanoid avatar. When Rigidbody is selected as the Tracking Type, either Motive:Tracker or Body can be use to stream the captured data. One can then select which rigidbody is tracking a body part in the Targets. OptiTrack can be enabled separately for the head, hand, hips and foot targets. For each target, a Tracker Id can be set to select which rigidbody is controlling this target. This Id corresponds with the Steaming ID of the Rigidbody in Motive.